It’s our 30th Issue and we have a couple of 30th anniversaries to celebrate too. I guess this should be called our “30th Issue / Anniversary Spectacular…Issue”! It’s been a quiet month or so since E3 2016 on the Nintendo front, but we have info on the newly announced NES Mini (coming out this Holiday) as well as a preview for Paper Mario: Color Splash. 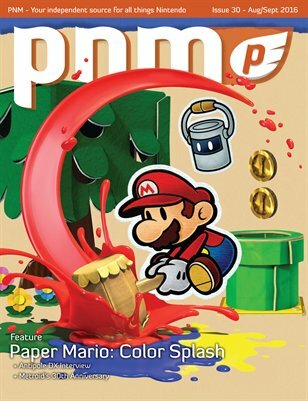 Be sure to check out our cover story on Color Splash to get a glimpse at the series’ past as well as its future. We also have some fan comments about the Legend of Zelda 30th anniversary and a feature on the 30th anniversary of the Metroid series. There’s even another anniversary we are celebrating and that’s the 15th anniversary of the Gameboy Advance—we pick our Top 15 Games. Be sure to also check out some amazing concept art for Monster Hunter Stories as well as our latest reviews and new fan art! Happy Gaming!